Ordered that Chesley R. Horner be released from payment of $0.50 charged on land taxes against him and his mother least for the same charged in 1851 to be paid in 1852. Y-DNA tests have proven that Chestley Horner was actually not a son of George R. Horner. The Y-DNA test results of Charles Horner [son of Jesse Gilbert Horner < Jesse Rufus Horner < Chestley Thomas Horner] is an exact match to Darrell Horner [son of John Bunyan Horner Jr. < John Bunyan Horner < William R. Horner < Chestley Thomas Horner]. Given that their closest Horner relative was Chestley himself, we are certain that the Y-DNA they currently possess is the same as the Y-DNA that Chestley possessed. In comparison, Don Horner [son of Joseph W. Horner < Josiah Turner Horner < James Washington Horner < George Washington Horner < George R. Horner] submitted his Y-DNA and it matches a male descendant of Thomas N. Horner [twin brother to George R. Horner] but does not match Darrell or Charles' confirming that Chestley's Y-DNA did not match that of his believed father, George R. Horner. I've written up an analysis below and would be happy to talk to any of you further. Please know that this is very common. Many times, DNA results ultimately tell us that our ancestors aren't always who we think that are. I've had the same thing happen on several of my lines. Darrell and Charles' Y-DNA very closely matches two Williamson males from upper Moore County. Y-DNA is specific to males and is passed only from father to son. So a male's Y-DNA is the same as his father, his father's father, his father's father's father and so on. Given that Charles and Darrell's Y-DNA matches the Williamson family rather than the Horner family means that somewhere along the line a Williamson male fathered a Horner son. Based on research I believe that is it most likely that Chestley was fathered by a Williamson [or a male with Williamson Y-DNA]. We have always wondered if Chestley Horner was in fact a son of the Revolutionary War soldier George R. Horner. In fact, the main reason for having Darrell and Charles tested was in hopes of proving this. 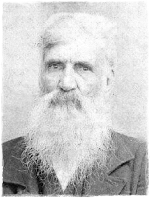 Chestley was born around 1827. He would've been the last child of George Horner and his second wife Priscilla Winslow. George Horner was born in 1761 and his second wife Priscilla was born in 1784. This would've made George 66 years old when Chestley was born. Priscilla on the other hand would've been 43. Fathering a child at 66 is certainly not impossible as there are plenty of examples of it happening, however it does seem unlikely. Chestley was also not mentioned during the application process for George Horner's Revolutionary War Pension nor Priscilla's application for a Widow's Pension. [Note: There are many errors throughout these applications citing George and Priscilla Horner's date of marriage prior to Priscilla's birth and son George W. Horner's testimony that he was born in 1784 when in fact he was born in 1817. I have always believed that these misrepresentations were due to the fact that George Horner's was married prior and legally separated in 1811 in Orange County, NC. His wife Elizabeth Fussell Horner later migrated to Dickson County, TN. I believe that Priscilla and son George W. Horner testified inaccurately based on concern that the first wife and family might be entitled to the pension if all were revealed.] Back to Chestley. From Moore County court and tax records, we know that Chestley ended up with the George Horner land on Locust Spring and that Priscilla was listed as his mother. He is also found in the 1850 living with George and Doxy Horner Williams. I am fairly certain that Doxy Horner was a daughter to George Horner and Priscilla Winslow and therefore a likely sister to Chestley. Another circumstantial piece of evidence is that Chestley?s grandson John Bunyan Horner was born in 1891 and his father William died in 1896 in Hope Mills, NC. As a young boy John Bunyan was orphaned, sent back to Moore County and adopted by William Thomas Horner. William Thomas Horner was the son of George W. Horner and grandson of George R. Horner. All of this leads me to believe that it is likely that a Williamson male fathered Chestley. It is entirely possible that no one knew that as he was clearly treated as family, ending up with the family home place as well as he and his descendants have very close affiliations with other Horners. Lastly, utilizing the results of Malinda Singletary's Autosomal DNA [which includes all lines not just paternal as with Y-DNA], she is a match to Ken Poole. Ken descends from the Williamson family and is also a Y-DNA match to Darrell and Charles. Ken descends from Ken Poole Sr. < Raleigh Wyatt Poole < Wyatt Willamson [1802-1893] < William Williamson [1744-1848] < John Williamson [1711-1823] < John Williamson [1684-1790] < William Williamson [1648-1690].